How to Stream Blu-ray movies to 3D TV with SBS 3D MP4 on Windows 8.1? Do you know how to stream Blu-ray movies to your 3D TV with side-by-side 3D effect on Windows 8.1/8? This article will guide you rip 2D/3D Blu-ray movies to side-by-side 3D MP4 with best 3D Blu-ray Ripper for Windows 8.1/8. The first choice: Play 3D Blu-ray discs directly on your 3D HDTV. You must consider that some latest movies do not come out 3D Blu-ray discs and if you like the movie very much and want to view it more than once, the Blu-ray discs are easily to be scratched by playing over and over. The second choice: Convert Blu-ray movies with 3D effect to play on 3D TV. The only thing you need to do is rip your 2D/3D Blu-ray movies to side-by-side 3D MP4 format before playing on the TV. Which choice would you prefer? I think most people prefer the second one which is more practical and could protect your Blu-ray discs while enjoying movies with 3D effect. As one of the best BD/DVD disc handling tools on the market, Pavtube 3D Blu-ray Ripper would be the suitable application to complete the process of ripping blu-ray movies to side-by-side 3D MP4 on Windows 8.1/8. It also supports backing up only movie content without extras to save time and storage space. Full Guide: How to Rip Blu-ray to 3D TV with SBS 3D MP4 on Windows 8.1/8? Step 1: Install and launch the latest Pavtube 3D Blu-ray Ripper onto your computer; then click "Load files" to import Blu-ray, Blu-ray ISO/IFO or Blu-ray/DVD folder. 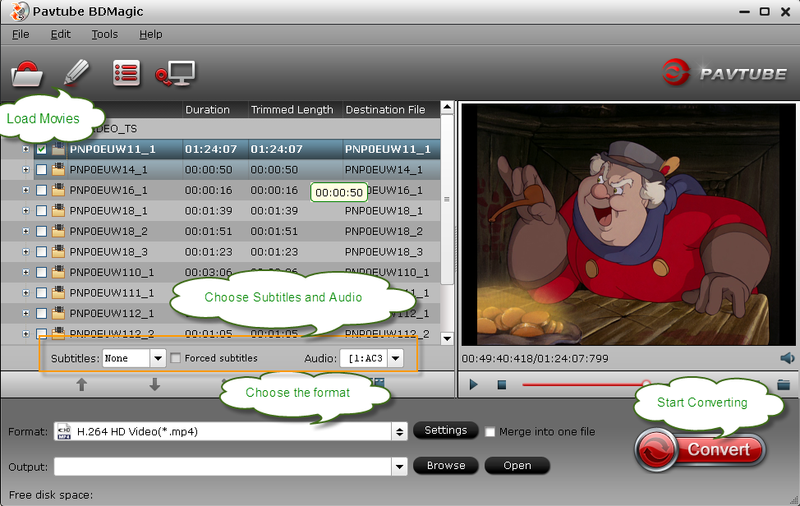 Choose subtitle, language or forced subtitles in the main interface. Step 2: From the Format bar, find "3D Video" catalogue, you will find several presets for Side-by-Side 3D, Top-Bottom 3D and Anaglyph 3D. You can choose the one according to your device specification. MP4 is usually the recommended one. Step 3: Click "Settings" to adjust bitrate, frame rate, 3D mode and depth according to your own need. Tip: If you want to rip Blu-ray movies with multiple audio tracks and subtitle sincluded, Pavtube ByteCopy is the best choice. Besides output good 3D effect, it is also able to encode the original soundtracks into 5.1 channels with your wanted language. 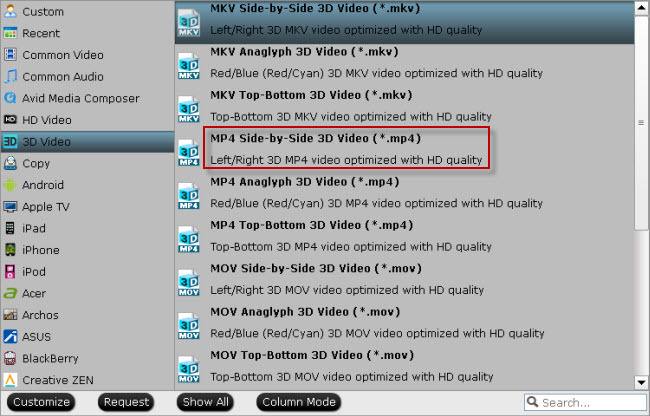 Step 4: Hit the "Convert" button to rip your Blu-ray movies to SBS 3D MP4 video for 3D TV. When it finishes, click the "Open" option to locate the created 3D video and transfer your 3D Blu-ray movie to 3D TV for entertainment.